Hello fabulous people! Today, I'm actually making a collab (ahhh my first collab so exciting!) with Imaan, she's going to have a similar post up on her blog with even more hacks to provide for all your girly problems! These are just a few of the hacks I could think of, some of them are not just for girls so to any boys reading, don't worry, I've got you covered too! 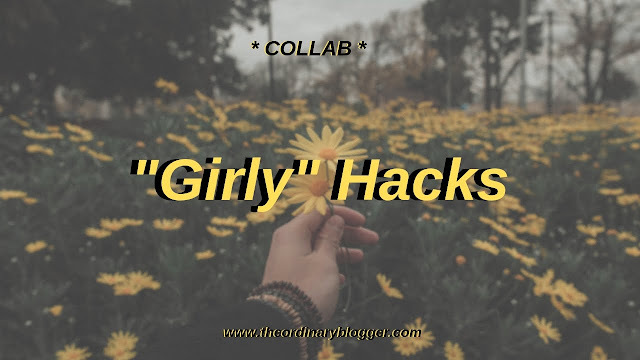 So here are some of my favourite "girly" hacks for you all! 1. If you spill nail polish you can use nail polish remover to clean it up! This might sound soooo obvious to you but it literally blew my mind (I'm not the sharpest tool in the box haha). 2. If you’re trying a new hairstyle put one mirror in front of you and one behind so you can see the back of your head. This saved my life when I was learning how to french plait, it saves that worry that what you're doing doesn't look like what you think and also if you make a mistake you'll know to fix it, rather than keeping going and realising at the end that you have to undo all your hard work! 3. Always exfoliate and moisturise before putting on fake tan to avoid it being patchy. Not gonna lie I'm a very pale gal, which to be honest I've learned to embrace over the past few years however, sometimes I want to be a bronze goddess (don't we all sometimes?!). So if I'm putting on fake tan/self tanner I always exfoliate and shave my legs the night before and moisturise to avoid it being patchy! 4. Spray your tights with hairspray to avoid ladders. I'm afraid if you've come here to tackle your fear of actual ladders that's not what I'm talking about, I'm talking about those little rips you get in your tights! I'm not too sure why this works but after years of being in shows I've learned that too avoid ladders in your tights you just have to give them a spritz of hairspray and you should be good to go! I've actually seen this hack around a LOT so a little while ago I decided to test it out myself and see if it actually worked and it did! I wouldn't go as far to say that I'm ditching shaving foam altogether BUT if you're in a bind, go for it! This isn't actually one that I've tried myself but I know that a few of my friends do this when they have trouble sleeping and I've only heard good things. It's definitely worth trying if you can't fall asleep! Where are these places you may ask? Inside your wrists, on your neck and inside your elbows and knees are the spots for perfume. Again, I'm not 100% sure of the science around this hack but I THINK it has something to do with your veins being close to your skin there? Anyways this should make your perfume last all day! I think this also makes your hair shinier! It makes a lot of sense if you think about it, the warm water opens up your pores and gets them lovely and clean but if you don't get them to close up again they'll just get bad stuff in them! For me this is definitely only a hack I use when I'm in a REALLY good mood because cold water in the shower is not a fun time for me! 9. Drink water to flush out toxins, improve your mood, boost your immune system and more! Yes, I really am that basic! I couldn't not include this because although just about every self care-y thing includes this it is soooo important! I used to barely drink any water but ever since I've started to become more conscious of my water drinking patterns I've felt so much better! Yes I know this is super cringe but it's so true! Even if you don't feel confident, fake it til you make it! I used to be super quiet and self conscious all the time until one day I just realised I didn't want to be like that so I really pushed myself to be more outgoing and to be myself more and my life is so much better for it. So that concludes my list of 10 "girly" hacks everyone should know! Be sure to check out Imaan's post for even more girly hacks and I hope you have a nice day! I absolutely loved doing this collab so if any bloggers ever want to work together never be afraid to reach out to me! As always thank you so so so so so so so so so so much for reading! Omg I just spilled nail polish on a blanket of mine so I threw it in the wash thinking it will take care of it but...NOPE. Idk why I didn't think of nail polish remover! LOL. I agree with the water and I haven't been sleeping too well lately so I may want to try out that chamomile tea you recommend. Great tips + thanks for sharing! Thanks so much! I'm glad these helped!